For debate: Is communication the key to student preparation? How Safe Are Parking Lots? Knowledge is Power: How Can We Contribute to Social Justice in Divisive Times? What makes a successful golf management university program? *Madeleine is a PhD candidate at the University of Minnesota. She currently teaches in the Sport Administration program at Laurentian University in Canada. ** Walker is a PhD candidate at the University of South Carolina. As PhD students, we often answer the question: “what’s your area of specialization?” It’s a reasonable question: it’s important have a clear and consistently personal brand on the job market. But, what if your research doesn’t fit into one of the established ‘sub-disciplines’ of sport management? When we met in 2017 (via Twitter posts on sustainability, of course), we compared notes and realized we both got the same ‘what’s your specialization’ question, and that answers such as ‘I study sport and the natural environment’ or ‘sport sustainability’ didn’t seem to satisfy the inquisitor. Perhaps the better answer is ‘sport ecology’, as this term is broad enough to include the full breadth and depth of the relationship between sport and the natural environment. We’d like to use this blog to advance the understanding that the relationship between sport and the natural environment is complex and dynamic, ever-present yet ever-changing, meriting a subdiscipline of its own. What it comes down to, is that sport’s relationship with the natural environment is about more than just recycling and turning off lights. As a starting point, it is important to recognize the fundamental relationship that sport has with its environment. Many sports developed out of social-ecological connections in their places of origin. Think of golf (from Scotland), ice hockey (from Canada), or surfing (from Polynesia). Changes to the planet’s ecological state, coupled with rapid globalization and commercialization, have and will continue to alter where and when sport is played and enjoyed. For example, who would’ve guessed there would be indoor alpine skiing facilities in Dubai, or irrigated golf courses in the Nevada desert? These changes present new challenges which complicate the previously taken-for-granted relationship between sport and the natural environment. It follows that a sport ecology sub-discipline should develop in response. We’re not the first to work in this space – we stand on the shoulders of giants: Brian McCullough, Tim Kellison, Sylvia Trendafilova, Melanie Sartore-Baldwin, Jonathan Casper, Cheryl Mallen, Haylee Mercado, Kyle Bunds, Greg Dingle, and others. These scholars have contributed substantially to sport ecology. There have also been contributions outside of sport management from geographers and natural resource scientists. Importantly, practitioners have been working in this space for decades: ski resort managers can tell you their job has everything to do with knowing and adapting to snow patterns; most college and NFL football games have a meteorologist on site (or at least, on call) to warn of storm activity; the golf industry has entire conferences and organizations dedicated to turf management. The term ‘ecology’ combines ‘eco’ (environment) and ‘logy’ (study). The emphasis on ‘study’ in ecology is important: we are scientists and our work, first and foremost, is to understand. Sport ecology would follow in the rich scientific tradition of human ecology, a derivative of geography and ecology, and would be related to recreation ecology (Marion, Leung, Eagleston, Burroughs, 2016; Monz, Pickering and Hadwen, 2013), tourism ecology (David, 2011), and business ecology (Abe, Bassett & Dempsey, 2012). In the sport industry, associations and conferences have emerged to address issues related to sustainability and climate change. Examples include the Green Sports Alliance and the Sports Environment Alliance. Many major leagues and organizations, including the NHL, NFL, PGA Tour, and the NCAA, have launched green initiatives. 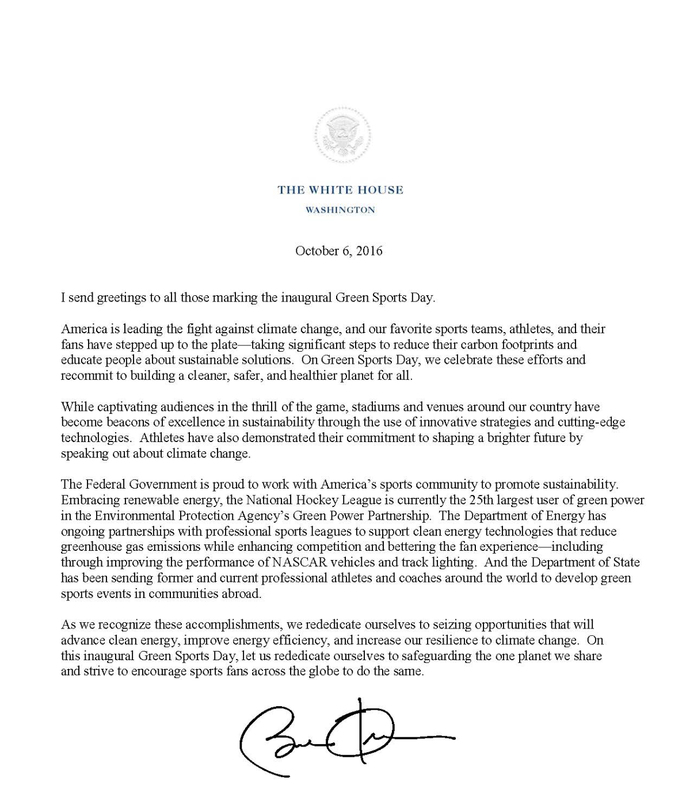 There is even a ‘Green Sports Day’, recognized by the White House in 2016. We are still working to define the boundaries of the sport ecology sub-discipline (we’ll get there – currently working on conference presentations and academic papers) And we would love to hear your input. Please, get in touch with us to discuss!